I will put my hands up and admit right out that this is a little bit of a poor Friday post. I had redone the entire tutorial myself with pictures and everything, but when I went to look back at them, they had come out all fuzzy :( So, I'm afraid we'll all just have to make do with Pinterest for now. The image is pretty self explanetory, but I will talk you through it anyway. Interesting tidbit, we have a little gecko as a pet [one of two - there were once over 12 but they were all different species]. My uncle brought him over to our house. He worked in a factory, I think, and a shipment of Stanley knives arrived, and inside was the little fella having hitched a ride over from...somewhere. We kept him, and he's been sat in his terrarium now for I think about 5 years. He eats his crickets like a good boy and is lightning fast. We call him Stanley ♥ At the moment, though, gecko-wise, we only have him and Turbo, a leopard gecko. If you're making a narrow or small stamp, consider drawing it on the end of the rubber instead of the side. This way you can save rubber and make more stamps! 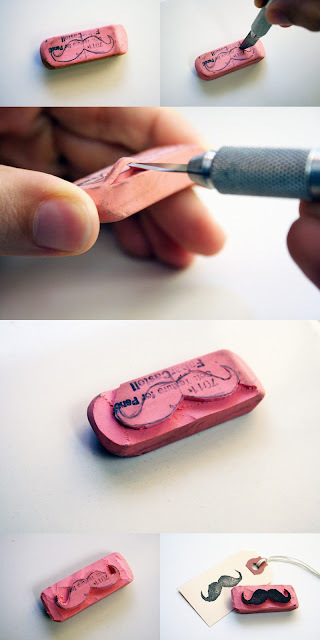 Once you've drawn your design onto the rubber, grab your craft knife and trace around the edges of the drawing. If you've felt brave (or foolish - time will tell!) and gone for a more complex design that requires details to be cut out from within the image, or something similar (for example, my feathers had 3 notches in the filament), ignore it for now. Cut the basic outline (for further example, I cut the feather out as if there were no notches, just one smooth line). Cut a little deeper than you want the stamp to stand away from the base - the further it stands out, the neater the print will be (and less chance of unsightly inky corners!). Mine stand at about 4mm out, which is more than it sounds. You may have found that actually the knife cuts through the rubber better than expected, but don't get too doolally! Once you've cut the outline, cut lines out from that to the edge of the rubber all the way around, then turn the rubber on its side and cut them so that they lift up. Proceed to undercut them until they come off, but be careful not to accidentally cut too far beneath the stamp itself - it's bound to happen that you'll make some cuts underneath it, but they shouldn't be a problem. So now your stamp has been cut out so that it protudes from the rubber's surface. Now, cut the details. I followed my lines and cut the notches where I marked them, then made a narrow cut down the middle length of the feather, then another 1mm along side it and cut it out. If your details are small, be careful you don't cut them too big by accident. If they're thin and you accidentally cut them off, don't panic. I'd advise against such a detailed design for your first try, but it didn't stop me either. I ended up accidentally cutting a portion of my teacup handle off, and decided it might be best to just cut it further so I could lift it up a little. I got some Mod Podge and was able to glue it back down and adjust it so it sat right before it dried, and it's absolutely fine now. And, just like that, you're done. You don't need to coat it in anything, once you're happy that you've cut the details out, you're done. If you made it on the end of the rubber, cut the larger part of the rubber away, so that you have a piece of rubber large enough to hold and press with ease. Don't try to cut the stamp design itself off of the rubber to mount on a piece of wood or something unless you can either cut a perfectly level line, or don't mind having to press at an angle. You can use the rest of the rubber to make more stamps (I used one rubber, cut a feather out on both ends, then kept the middle third to use as a general rubber). Don't try to cut the new end straight for another stamp, though, it's almost impossible. I think. I don't know, I tried it and just ended up shaving off more rubber because the end was slightly wonky. I'm a perfectionist. It must be straight, dammit! great idea... I just pinned it... thanks!